Am I alone in having good intentions that frequently outshine my actions? Surely not. Though I’ve thought (and written) much about our intentions to live as sustainably as possible, in real life, time or cost often win out against worthy ideals. So, yes, I grow a lot of veg and get a weekly organic veg box, but (whispers it) I also do a monthly online Tesco food shop. Even though I hate Tesco and everything they stand for, without a car we can’t do a regular big shop ourselves and Tesco is currently the only supermarket who will cheerfully deliver to us without plastic bags and carry the crates of food all the way through to the kitchen. But with our country move delayed, and, with it, plans of a more self-sufficient lifestyle also put on hold for a few years, I am determined to try and be more conscious about the food we consume as a family. Though we’re not a gluten free household, I am aware that almost everything the kids like to consume is packed full of the stuff (pasta, bread, cakes and biscuits making up pretty much the entire list of foods that will be allowed past their lips) and I’m always looking for ways to vary this unending wheat onslaught. I’m quite passionate about this subject for a couple of reasons. Firstly, the farm that Jamie visited is owned by the hubby’s relations, who are just as brilliant and fun as they seemed on TV and do an amazing job of running an organic farm and spreading the message about pullet eggs. Secondly, since owning our own chickens and watching, with astonishment, when they first started laying these adorable little tiny eggs, I can tell: you they taste bloody brilliant! How anyone could discard such an insanely tasty egg simply because it is a bit smaller than usual strikes me as pure insanity. Anyway, it is now possible to buy pullet eggs, either direct from The Mac’s Farm in Sussex, if you happen to live close by, or via FarmDrop if you’re London based, and nationwide from Abel & Cole (where they’ve called them “petite eggs”). Surely one of the most iconic sights of Africa, the baobab tree casts such a mythical hold that it’s unsurprising its fruit has gripped public attention. And with health benefits that are seemingly un-ending (it contains more vitamin C than an orange, just for a start) baobab powder has been popular in health food stores for some time now. In past years, though, baobab production has really taken off, with a number of sustainable initiatives starting in a range of African countries. Many of the organisations involved with the trade of baobab to the west are conscious of the need to address issues of monoculture and deforestation that have been rife with popularity of other crops. I’m yet to test the baobab and, I have to confess, I remain sceptical about endless health claims from any one food, but with a huge range of baobab foods available in the UK now, I’m going to search out some baobab rich snacks and see if it’s something I can incorporate into my diet. Check out Planet Organic’s range for a huge choice! When I was growing up, as one of four children, being fussy wasn’t an option. I don’t think it ever really occurred to any of us that we might not eat a meal – we were normally too busy fighting over the seconds. Sure, there was certain food I wasn’t as keen on as other things, but that just meant I didn’t ask for a double portion. So I always assumed that my own children would repeat this behaviour. In those pre-spawning days when you’re an absolute expert on childcare, I scoffed at the idea of fussy eating children. Clearly, clearly, it was simply the parents’ fault in one way or other. Giving them alternatives to foods, or allowing them not to eat certain things or perhaps, conversely, getting into a fight about eating certain things. In my house, mealtimes were going to run smoothly. I’d cook something. I’d put it in front of the kids. They’d devour it and ask for more. I also used to find it amusing that though my sisters and I all love cooking – a skill we all picked up in our Uni years and onwards – my Mum never shared that passion. I didn’t really question why someone might not love cooking after, what, a solid 25 years of preparing meals for all or some of her four children, I just thought it was something in the genes. A little quirky oddity, that meant the love of cooking skipped a generation to land – fresh from Masterchef heaven – in our hearts. In fact, I’d even go so far as to say that, pre-spawning, I actually thought cooking the evening meal for my children would be one of the highlights of my day. You know, I’d be standing, Nigella-esque, at the oven, whipping up some healthy, organic, delicious piece de resistance while the children – well, I don’t even know what I thought the children would be doing while I happily cooked in the kitchen. Cheerfully helping me, without making a mess? Getting on with some brilliant independent play all on their own? Perhaps writing a great novel, or composing an opera, or working on a cure for cancer. Probably something like that. And, actually, in the first year of the sproglet’s life, all did go according to plan. I was one of those bloody annoying mothers who did the baby led weaning with the organic vegetables from the weekly Abel and Cole box. Snacks were apples or roasted butternut squash chunks or rice cakes. And everything – everything – for that blissful period between six months and a year, was consumed without question by the pliable sprog. He’d got the memo! I was delighted. And, perhaps, even a little smug. On his first birthday, I cooked the sproglet his first ever cake. Cupcakes. I thought that – since he hadn’t really had any sugar until that point – he might take it or leave it. I was wrong. He hoovered up three cupcakes within a minute. The next day, we had another party to go to. He refused to eat anything but cupcakes. And, from that point on, it’s been a steady decline. On a really good day, a morsel of broccoli might pass by his lips. But a hearty, lovingly-prepared chicken stew? Home-cooked steak and kidney pie? Even (and I can never quite wrap my head round this one, since it was a favourite from my childhood) bubble and squeak? No, no, no thank you. Not eating that, thanks, Mum, I don’t like it, can I have something else instead? And the littlest, who used to be a really excellent eater, has taken to copying his big brother, and developed extreme fussiness of his own. So, after two years of having everything I ever cook pushed around a plate, shunned and, frequently, thrown to the floor, I somehow find that “genetic” love of cooking has vanished into the ether. So, I’m pretty certain that when they hit 20, my boys will suddenly discover a great zest for cooking and look back at their poor old Mum’s sorry efforts in their childhood with wonder and despair. In the finals of Masterchef 2033, they’ll recreate a “memory of childhood” with a pasta and red sauce vapourised air and joke with a white-haired John and heavily-wrinkled Greg that it was the only dish their Mum could ever cook. As they hold the trophy aloft – the first sibling duo to ever win joint first – they’ll smile with pride and say how they learnt everything they ever knew from the internet. And then they’ll have kids of their own and a tin of baked beans will, once again, seem like a gourmet delight. I’m a chronic over-caterer. I’d far rather have leftovers for weeks than the thought of – good god! the horror! – a guest leaving the house after a meal still feeling a little bit peckish. This urge to feed someone more food in one day than they could reasonably eat in a week really comes to the fore at Christmas time. And so it was this year. We ate red cabbage with pomegranates and dill for a fortnight, and there’s another Tupperware dish of it in the freezer. And there’s still a little corner of the gingerbread house (seen here) waiting to be eaten. As far as I’m concerned, bountiful leftovers are all part of the fun of Christmas. But when it came to fruit, I went so overboard that there was no possible way we could eat it all before it went off. We had oranges, clementines, quinces and apples stacked up in huge piles across the kitchen, and every morning I kept finding at least one mouldy piece of fruit that had to be thrown away. So, last week, I decided it was time to use them all up in one fell swoop and, with the “assistance” of the sproglet and the littlest, we spent a day of somewhat manic preserving, our clothes reeking of vinegar and melted sugar by the end of it. Come, take a closer look at the finished delights. 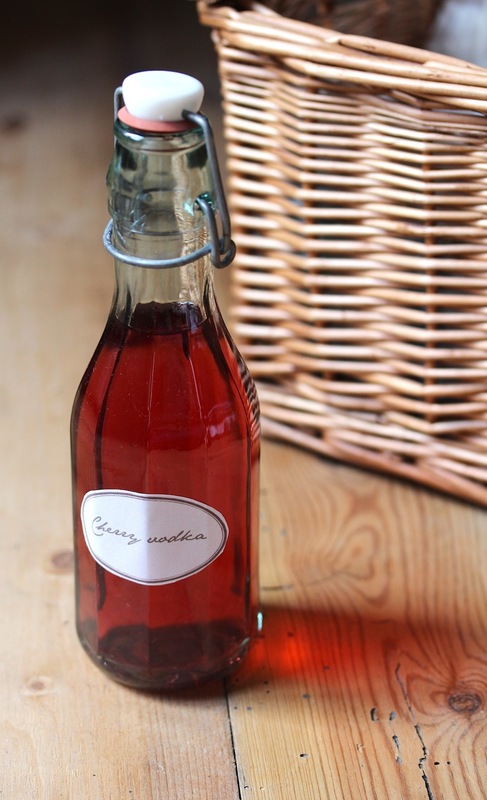 Using the River Cottage recipe from my well-thumbed Preserves book, I made a batch of St Clements cordial. I chucked in the juice of oranges, lemons and a few stray grapefruit I found hanging out in the fruit bowl. Basically, you juice them all and then boil them up with a vat-full of sugar. The end result was nice but for someone who never really drinks squashes, I found it exceedingly sweet. Actually, the kids had a glass each and then hared round the house on a crazed sugar high for about an hour afterwards, before collapsing into tears and tantrums. I won’t be giving it to them again. Still, it looks beautiful in this old lemonade bottle, no?! Then a slightly odd enterprise: whole clementines which have essentially been tinned in a sugar syrup (and some kaffir lime leaves) in these jam jars. Finally, my favourites: a couple of fruit jellies. 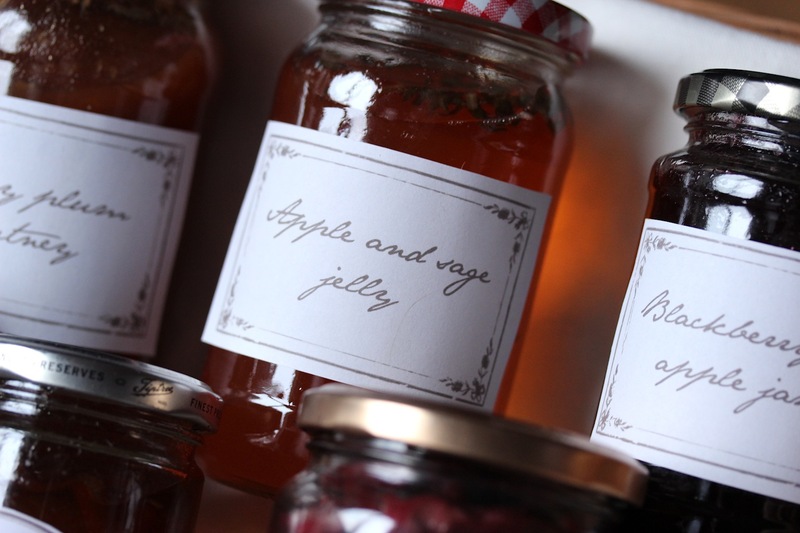 I made my trusty apple and sage jelly recipe, which I just adore and always get through incredibly quickly. It’s perfect with sausages if you fancy making up a few jars. And then, using the same recipe, but without herbs, I made up some quince jelly too. I’ve tried this once before, and my top tip is that the quince pieces you discard in order to keep the flavoured juice are still perfectly usable. Last time round, I made them into a quince tarte tatin, which was delicious. 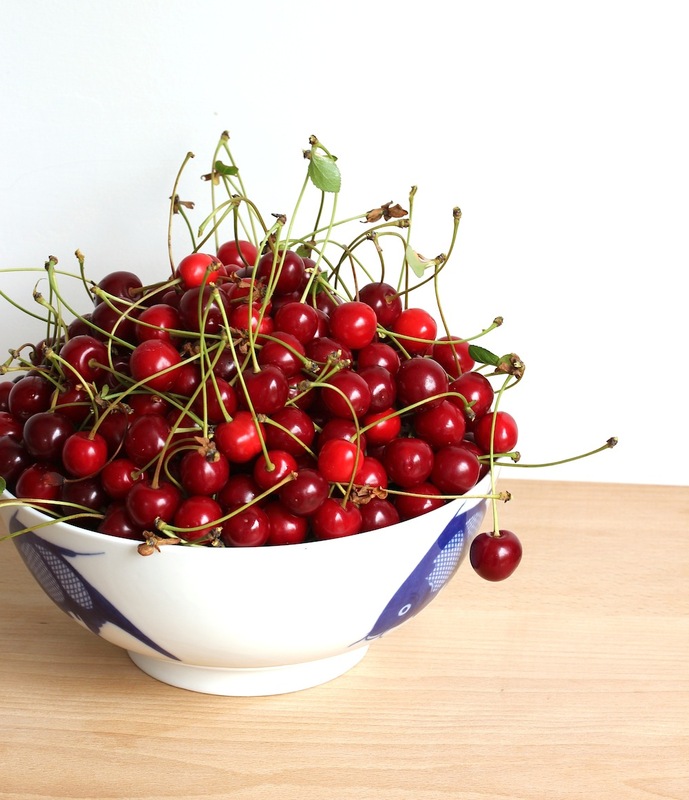 It was a bumper harvest from our little morello cherry tree this year. We planted it two years ago, in the front garden, and – until now – it had spectacularly failed to either grow a lot or produce very much fruit. 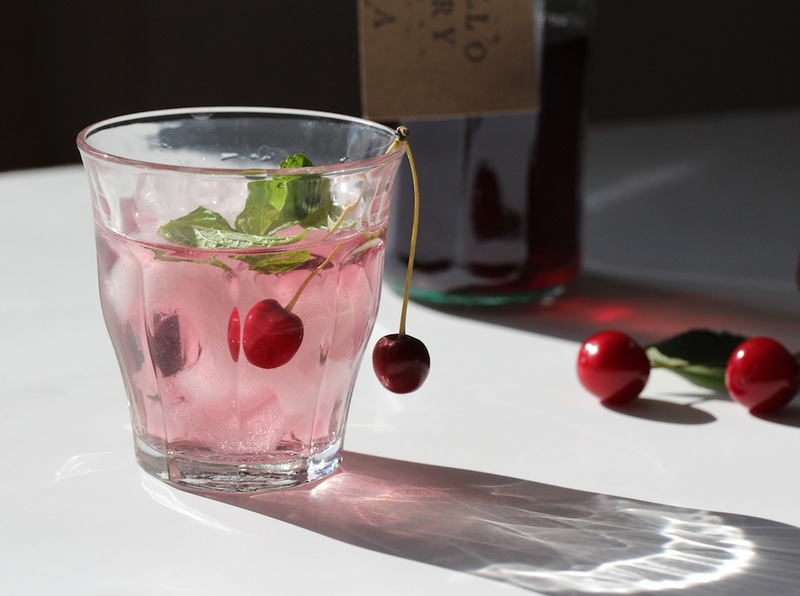 But, back in Spring, I was excited to see the branches weighted down with blossom and I had a good hope for enough fruit to do more with than my usual annual bottle of cherry vodka. I wasn’t disappointed. 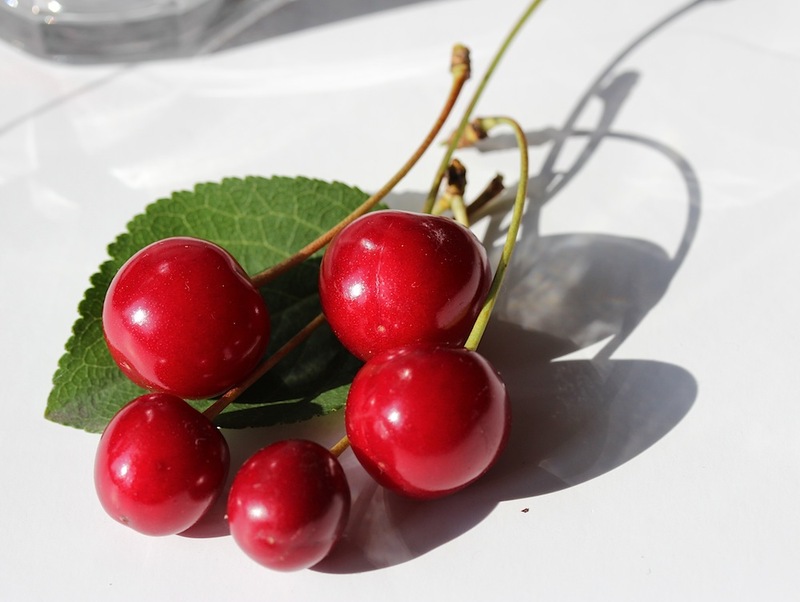 In fact, so low-slung were the branches from the mountains of cherries that I feared they might never regain their normal shape again. After a good cherry harvest (with excellent help from the littles) we were left with a giant bowl of cherries, ready to cook up and turn into something fabulous. 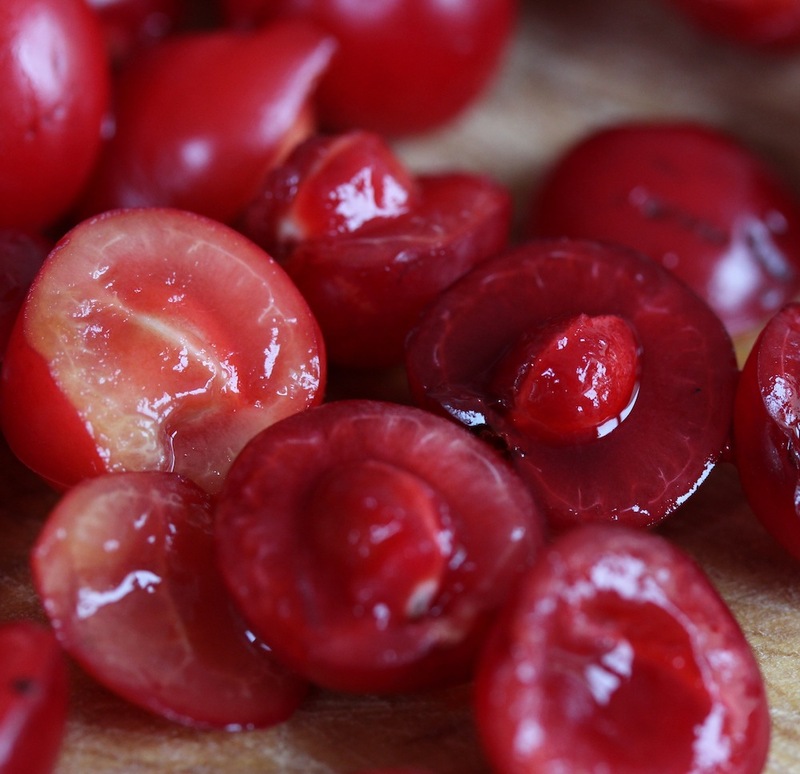 Morello cherries, despite looking fabulously glossy, red and biteable, are actually quite sour and can’t be eaten without cooking and / or adding a large dollop of sugar. I ummed and ahhed with the idea of cherry jam or a cherry pie, but in the end settled for a huge batch of compote since it can be added to so many other things. It’s hardly even a recipe, so simple is it to make, but here it is written down for anyone interested. 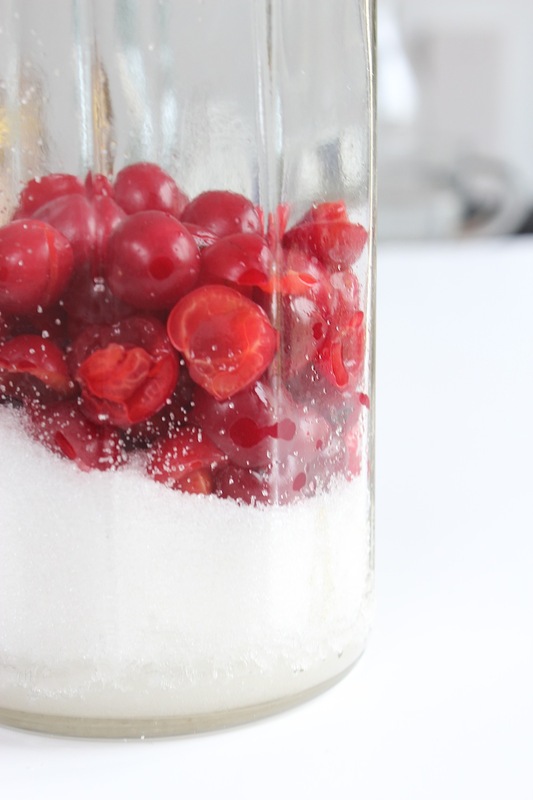 Wash and halve cherries and remove pips. 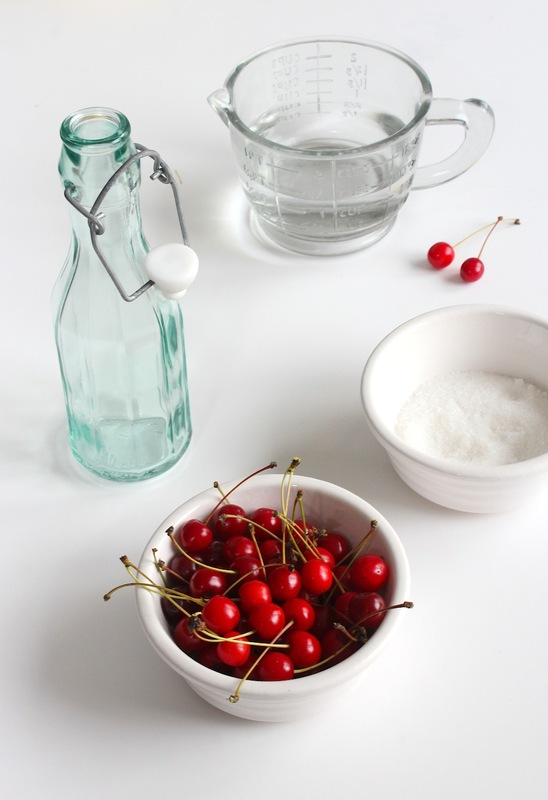 Place cherries and sugar in a pan, with a tablespoon of water for every 300g. Cook, over a gentle heat, for about 10 minutes, until the fruit is soft but hasn’t lost its shape. 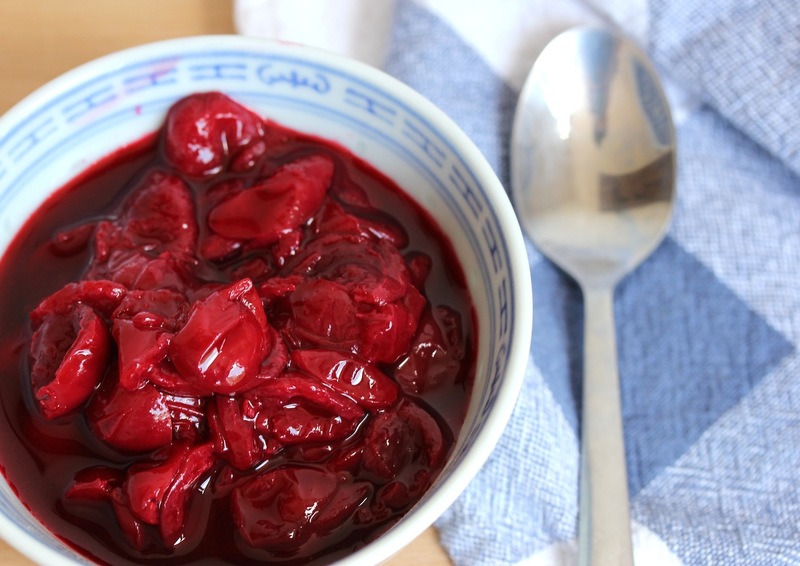 You could eat the compote hot, with something like a chocolate or rice pudding, or let it cool and keep it in the fridge for a couple of weeks and turn it into any number of other wonderful things. 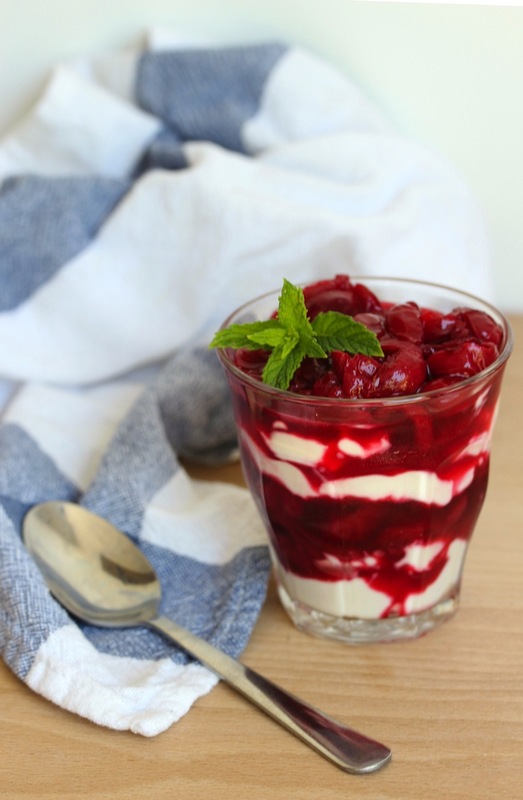 I used some of mine to make ice cream, by using our ice cream maker to churn a tub of natural yoghurt, then adding a bit more sugar and a few tablespoons of the cherry compote right at the end. Most delicious though, was this layered pudding, made with a layer of the compote followed by a layer of crème fraiche and then repeated. I didn’t have ay amaretti biscuits, but some crumbled over the top would have made it even more toothsome. I’ve said it before, but I’ll say it again: I am just absolutely bloody loving this good weather. Oh, the sun! Oh, the warm temperatures! Oh, the chance to potter around the garden, smelling the fabulous springtime smells of new growth out there! Actually, though, not a huge amount of pottering has been done in the garden as much of the new growth is in the form of weeds. While I turned my back for a week or so, the weeds took over, until our main flower bed was basically one mass of weeds with the odd desultory flower poking through. So, rather than potter, I have been weeding at every spare second I get. I say this in no way as form of complaint. I rather enjoy weeding. There is something quite pleasing about crouching down in the grass, in front of the flower bed, carefully tracing a weed flower back to its roots and plucking them out of the ground, taking care not to disturb all the bulb foliage alongside. 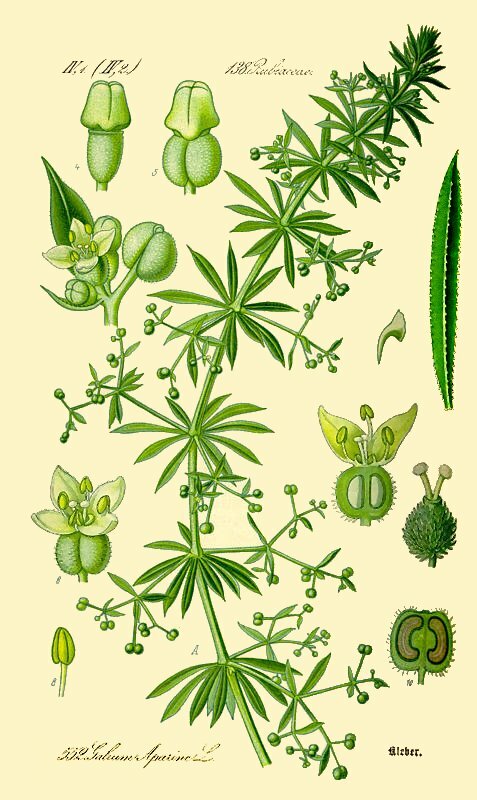 Of all the weeds in the garden, it’s cleavers, or stickyweed, sticky willy, goosegrass (Latin name: Galium aparine) (botanical illustration above) of which we have by far the most. It spreads and spreads and spreads. In fact, in the time it’s taken me to write this, it’s almost certainly taken over a good square metre of garden. And while I knew that there were certain weeds you could eat (nettles spring to mind as one of the better known), it never occurred to me in a million years that I could actually put cleavers to use by, shock, consuming them. 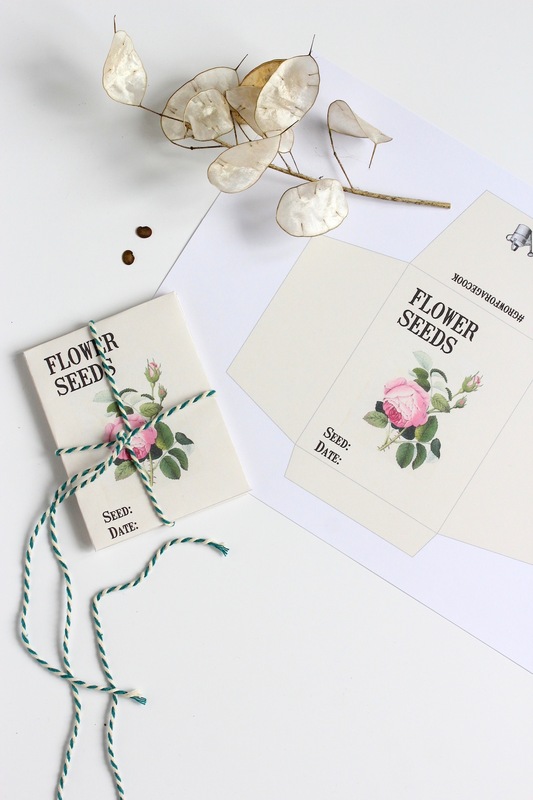 But, reading a recent post on the wonderful Seeds and Stitches blog, by Fore Adventure, I discovered you can do exactly that. I know! I nearly fell off my chair too. 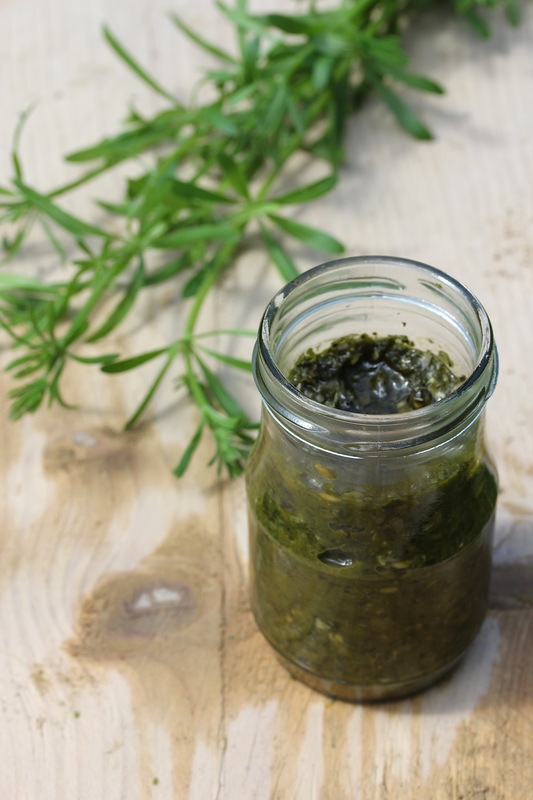 This recipe for salsa verde uses whatever green herbs you can get your hands on. Including nettles and cleavers. So on Sunday, I decided to do a bit of weeding and make myself my own salsa verde. I adjusted the recipe a bit, to use what I had on hand. 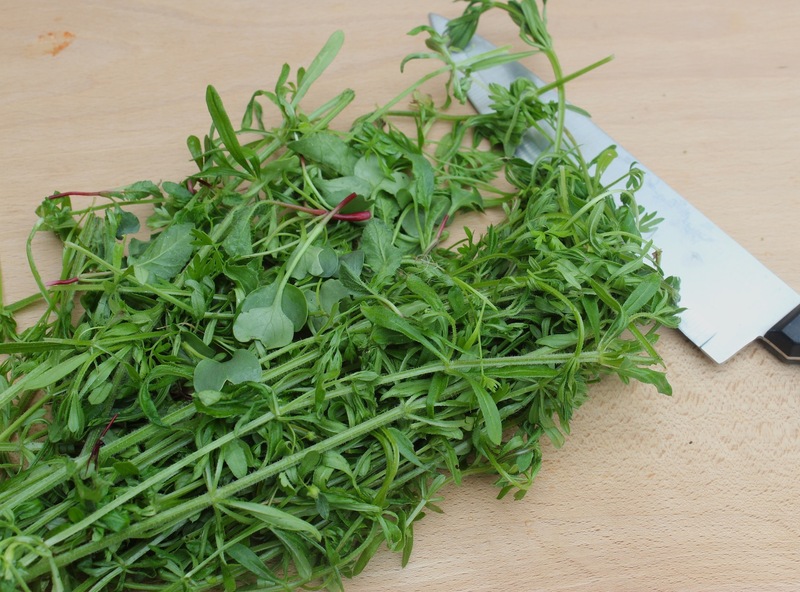 My greens of choice were a big old bunch of cleavers, fresh from the flower bed, along with some carrot, beetroot and radish thinnings. Along with a few capers, as in the original recipe, and some olive oil, I roughly chopped the greens and then just blitzed the whole lot in my hand held blender. In fact, the only thing about the recipe that took any time was washing all the greens in the first place. I have to say, I was rather sceptical about just how tasty cleavers was going to be to eat. It’s so dratted sticky I could imagine it being rather unpleasant to swallow. But I was more than pleasantly surprised to discover that the salsa verde I made was actually bloody delicious. I’m not sure you really taste much of anything beyond the vinegar and pickled vegetables, but there is a definite spring freshness to it, provided by the cleavers, though I couldn’t give you any specific identifiable flavour they have. I only made a small jar, in case it hadn’t turned out too nice, but I will definitely be making it again. I might even experiment with a few other weeds this time. Now, if only bindweed was truly palatable, my garden would be a place of great productivity at all times. If there’s a better present in the world than a hamper at Christmas, I’ve yet to come across it. This year, as you may have seen, I’ve been busy with a new series, Grow, forage, cook, with my lovely friend Laura (of Circle of Pine Trees). 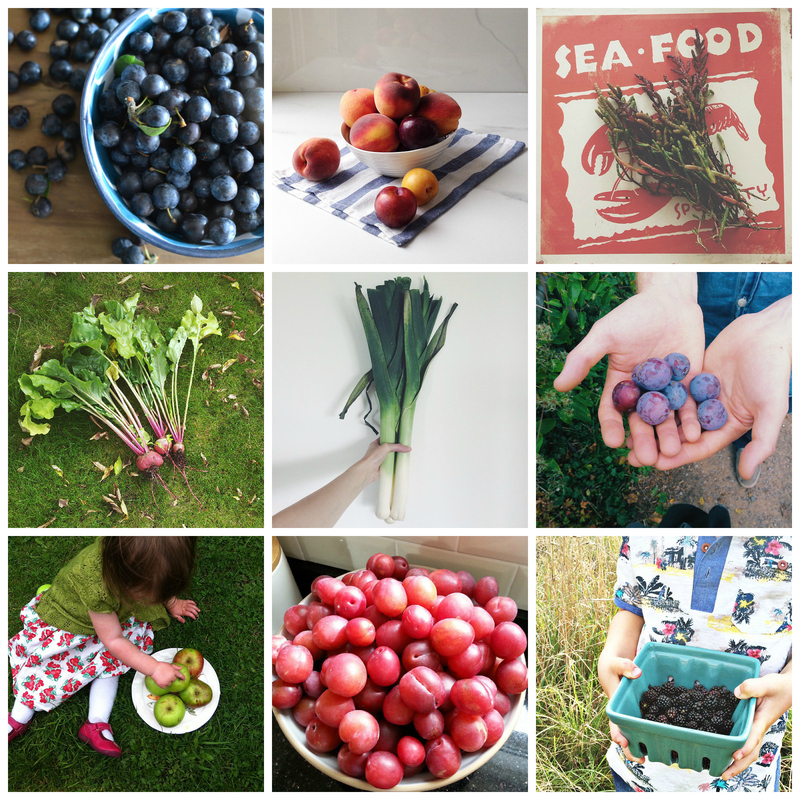 We’ve been sharing recipes, ideas and inspiration for homegrown, foraged and seasonal food. So, for the middle of November, it seemed like a pretty good idea to put together a Christmas hamper using some of our favourite makes. I usually follow a recipe in my ancient Good Housekeeping cookbook. 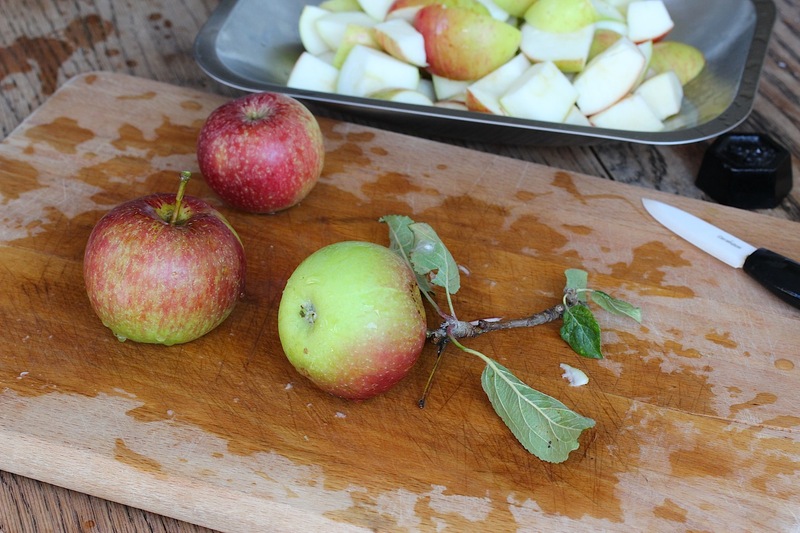 Laura goes by the Riverford recipe to make her equally delicious looking batches. 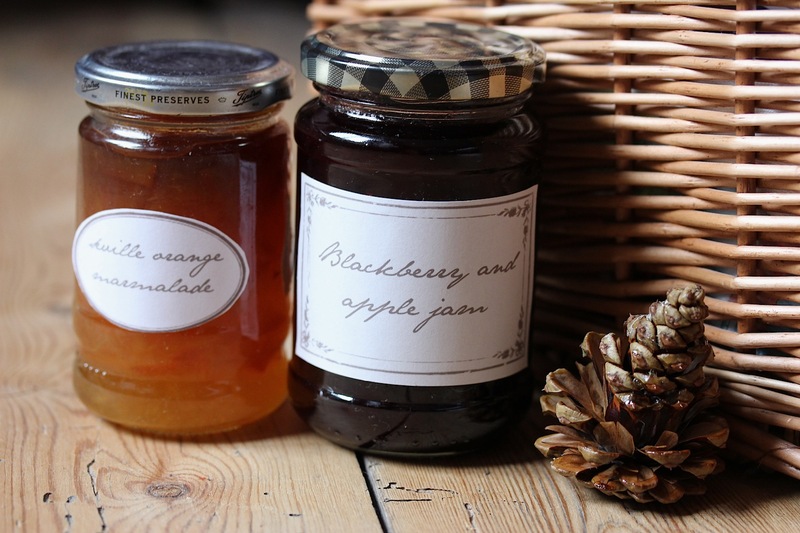 Apple and sage jelly: the king of all preserves. 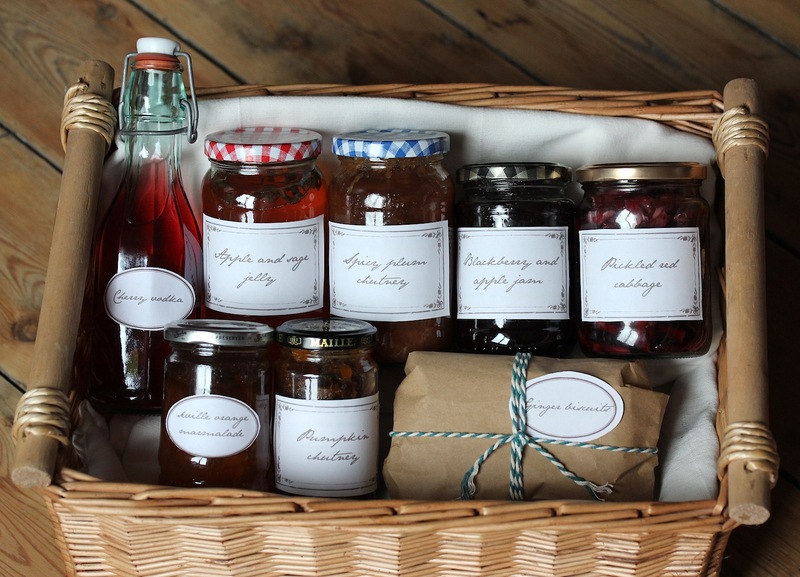 Then you’ll need something to eat with all those chutneys and jams. A few homemade biscuits is a good start. 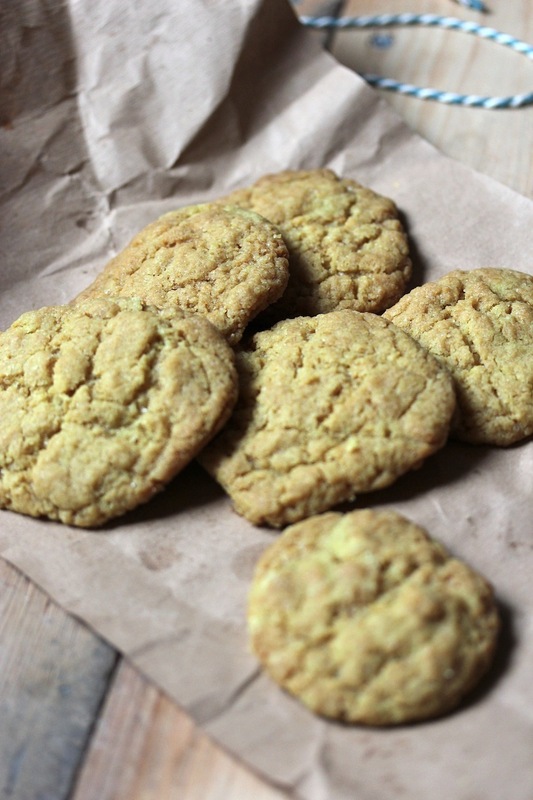 I’ve included some absolutely amazing ginger biscuits, following Laura’s recipe for ginger snaps. If ginger’s not your thing, you could also try the even more festive white chocolate and cranberry cookies. Now, I know what you’re going to say about my inclusion of pickled cabbage. Cabbage? For a present? For Christmas? 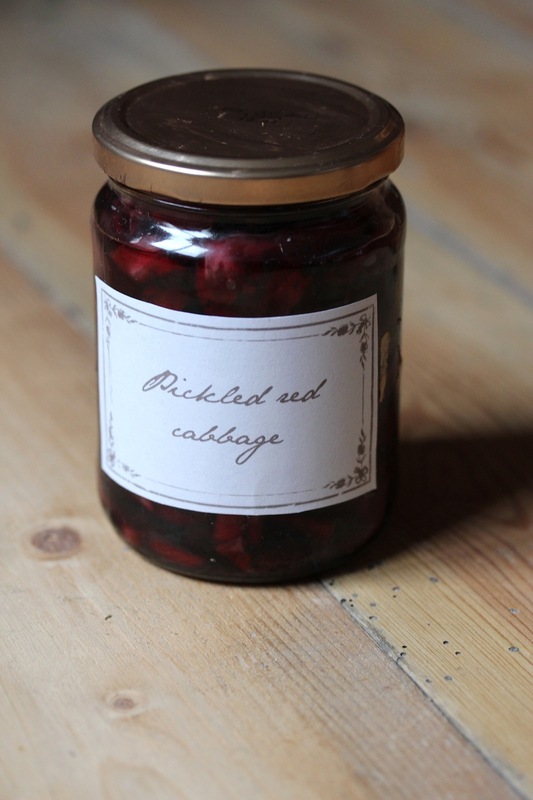 My sole rejoinder: if you’re friends with someone who wouldn’t, secretly, love to consume a jar of pickled red cabbage on a winter’s evening, then you should probably stop being friends with them. I haven’t actually posted a recipe for this on the blog (yet!) but I shall get on the case forthwith. ‘Til then, you can find plenty of different versions with a quick Google. Then for the booze. 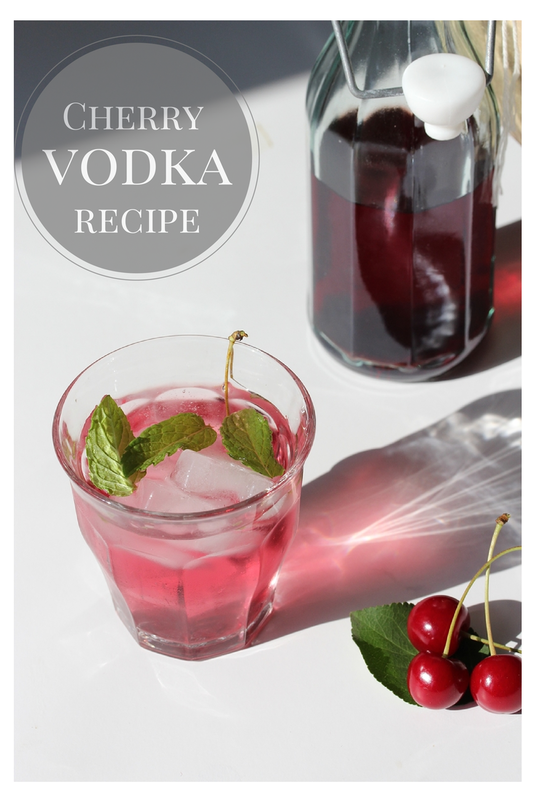 I’ve made some morello cherry vodka, this year, which will certainly be going in, along with some of last year’s blackberry and apple vodka. 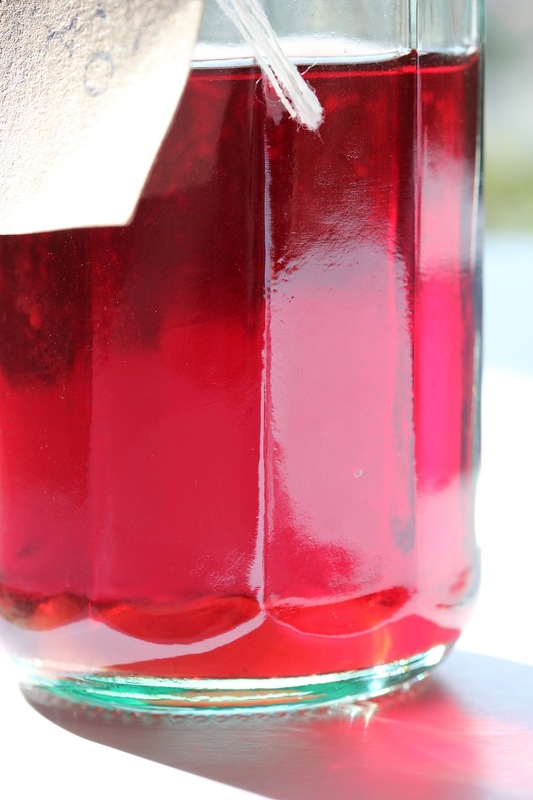 Sadly, my haul of damsons from my Dad’s garden was left in the footwell of a hot car, but had they survived I would definitely be adding a bottle of Laura’s amazing damson gin. Food and drink complete, a few little festive touches to adorn the hamper. I’ve followed Laura’s tutorials for some pinecone firelighters and this lovely orange peel garland to adorn the wicker basket. Oh; a word on presentation. 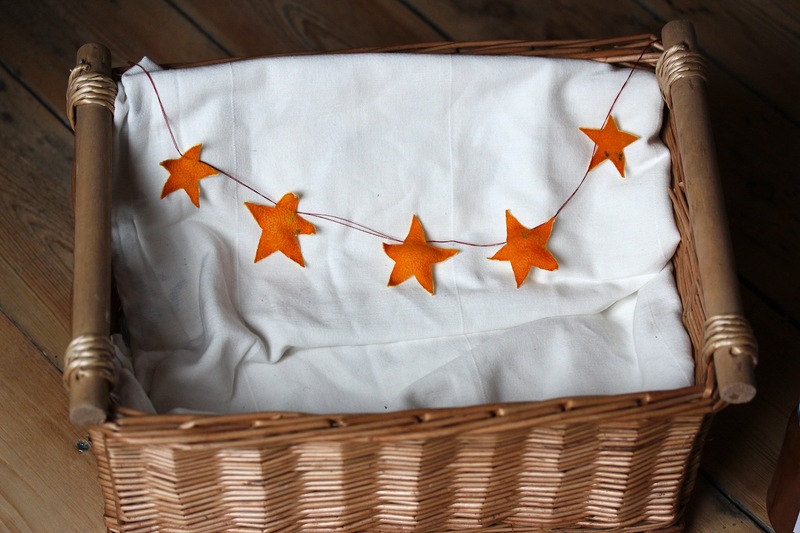 It is absolutely key in my opinion when giving homemade presents. I spent a ridiculously long time once making some chocolate truffles, only to give them away in a Tupperware box. In fact, an old Indian takeaway box at that. I don’t think the recipient can have had any idea that I had lovingly concocted them over the course of a few days. The labels I’ve used here are downloaded from the World Label website (free, fillable templates designed by Cathe Holden are available here: Apothecary labels). For the text, I’ve used a free font called Jane Austen. (Available from Da Font here: Jane Austen font.) And I’ve got to say, I’m pretty happy with the way it all looks! So there you have it! A very first Grow, forage, cook Christmas hamper, full of delectable treats (in my humble opinion). 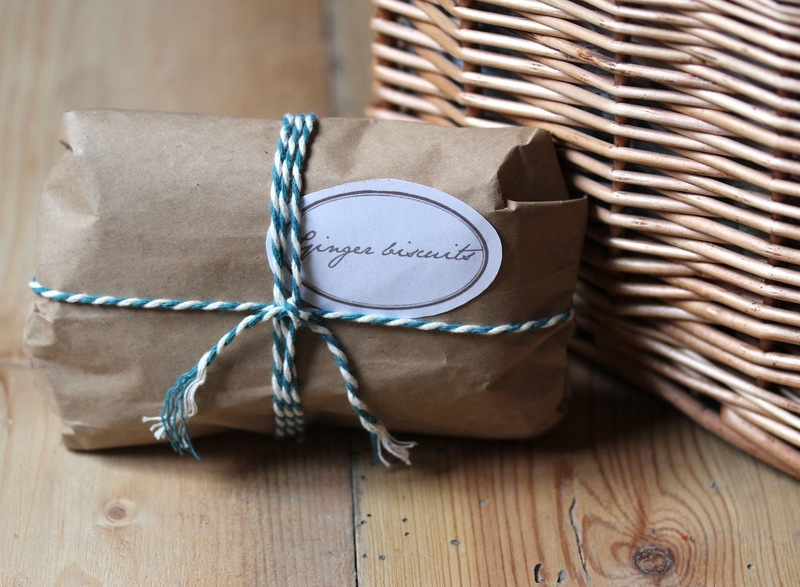 Will you be making any foodie presents this year? Is there anything I’ve missed out that really deserves a place in its wicker belly? Do leave me a comment and let me know: I’m always on the hunt for lovely new recipes and lovely new ideas! Ah, September, always one of my favourite months of the year. But, birthday ramblings aside, September is usually a month of the most wonderful weather and this year has been no exception. The Autumn light creeps in, the leaves turn, the conkers appear and I thoroughly enjoy sticking on my wellies for a walk to the park. Of course, this is also the month with the best harvest and I have been so enjoying following our #growforagecook hashtag over on Twitter and Instagram and seeing what everyone has been up to. Here is a selection of some of our favourites from this month. Bottom row, left to right: Carie May @cariemay; The Linen Cloud: Plum jam and @thelinencloud; Capture by Lucy: @capturebylucy. All wonderful, aren’t they? And enough to make you reach immediately for the spade, secateurs or mixing bowl! 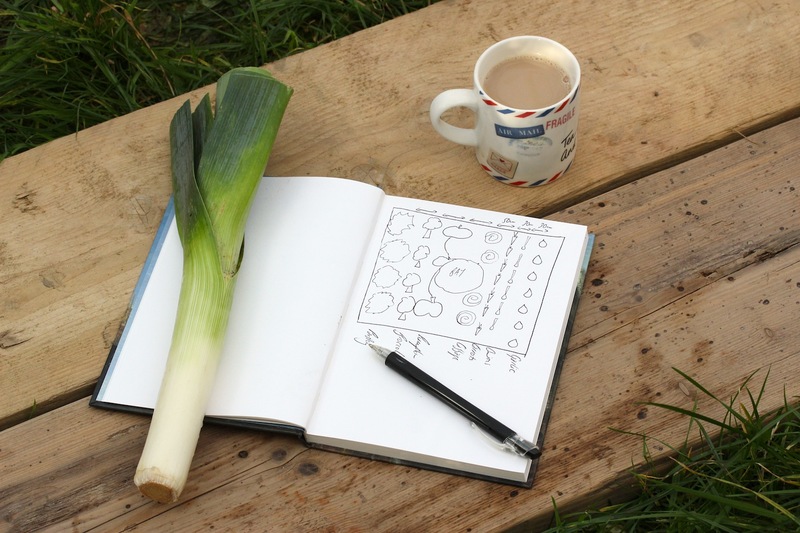 And so October approaches, I feel drawn towards winter veg and endless pickling, along with my feet up on the sofa, poring through seed catalogues to plan the veg garden of my dreams for next year… What will you be up to in the coming month? I’m sure I can feel the days shortening imperceptibly each evening and my summer duvet is wrapped more tightly around me each night. I’m trying not to moan because, after all, we did have a glorious July, but there is something a little depressing about an August that already feels as if autumn has hit. But, on the plus side, the arrival of autumn a little early this year means the early arrival of harvest time, hurrah! And what a bumper harvest it has been so far. It seems to have been an especially good year for plums. 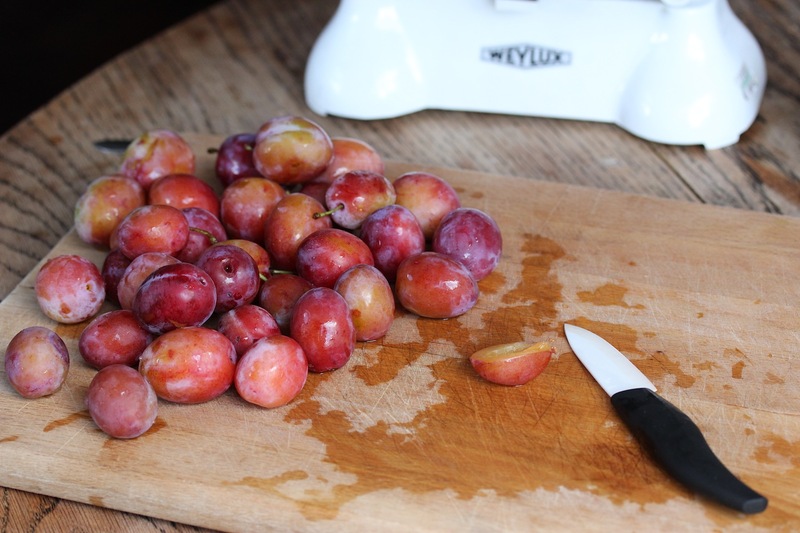 My fellow Grow Forage Cooker, Laura (of Circle of Pine Trees) shared three glorious looking plum recipes last week from a basket filled to the brim at the local PYO. 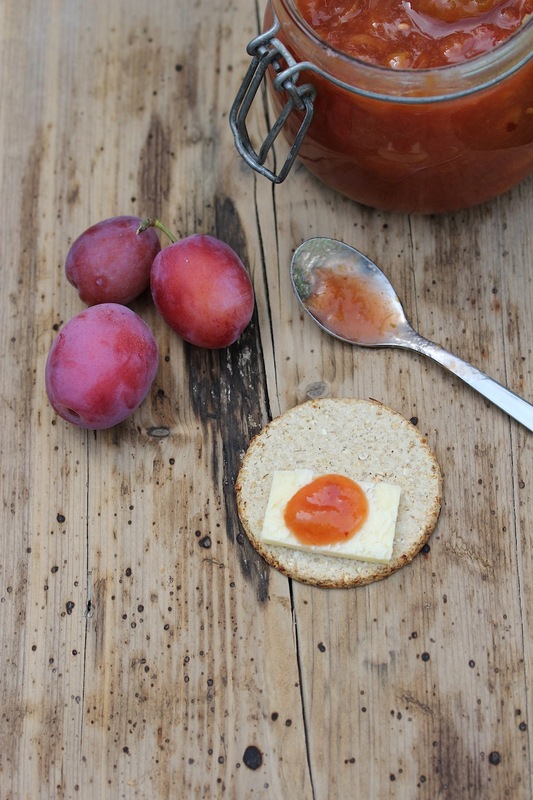 This is a selection of seriously delicious looking plum treats: plum clafoutis, plum cake and plum jam. 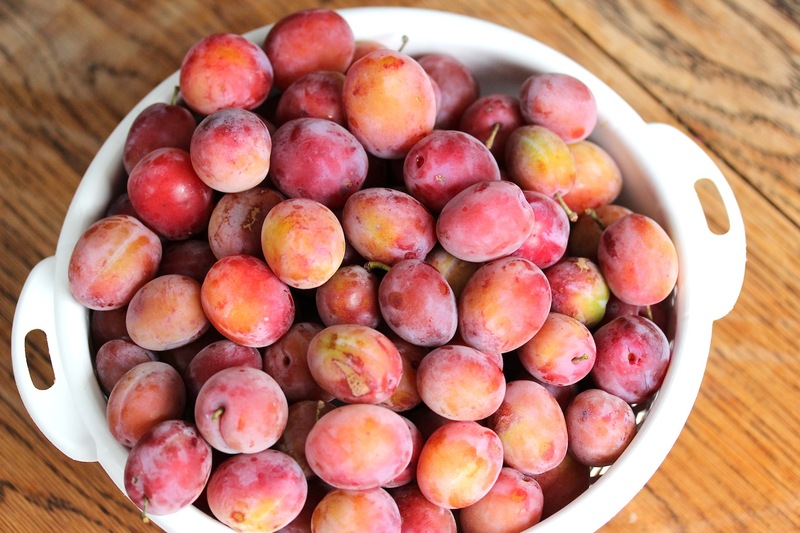 Head over now if you’ve not already seen the delights: a basket of plums. 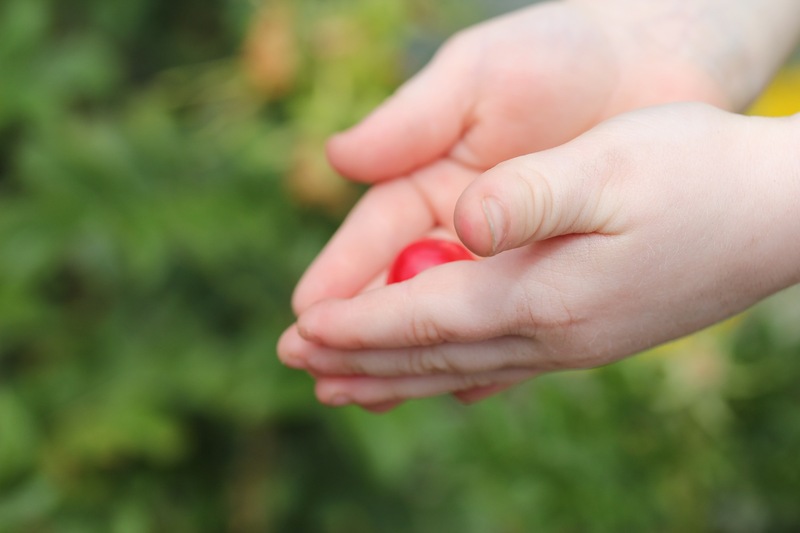 This week, I’ve got plums in my hands too, hem hem, since our plum tree has had a rather magnificent bounty this year. What a bowl of plums! 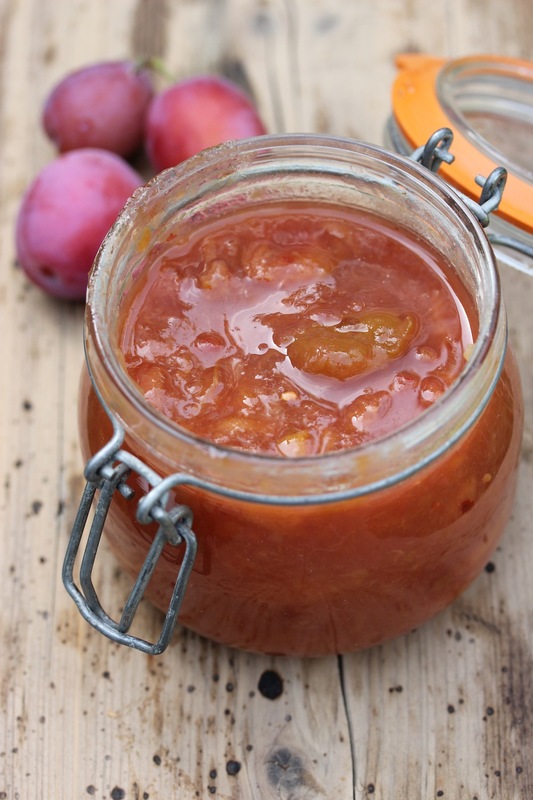 So if you, too, have more plums than you know what to do with, here’s another recipe, this one for a spicy plum chutney, that tastes particularly fabulous at Christmas time with cold meats or cheese. 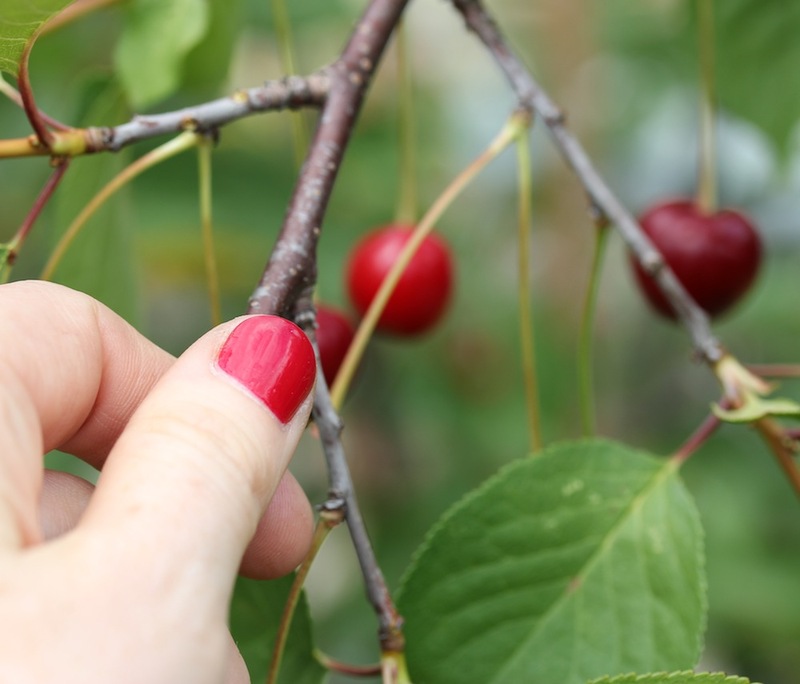 And if you’re growing, foraging or cooking anything yourself with seasonal ingredients, do please share it with us. Use the hashtag #growforagecook on twitter or instagram and tag either of us (@circleofpines and @wolvesinlondon) or leave us a comment on our blogs to share any photos you’ve taken, recipes you’ve made or blog posts you’ve written. We’d love to get some inspiration / drool over some delicious photos. 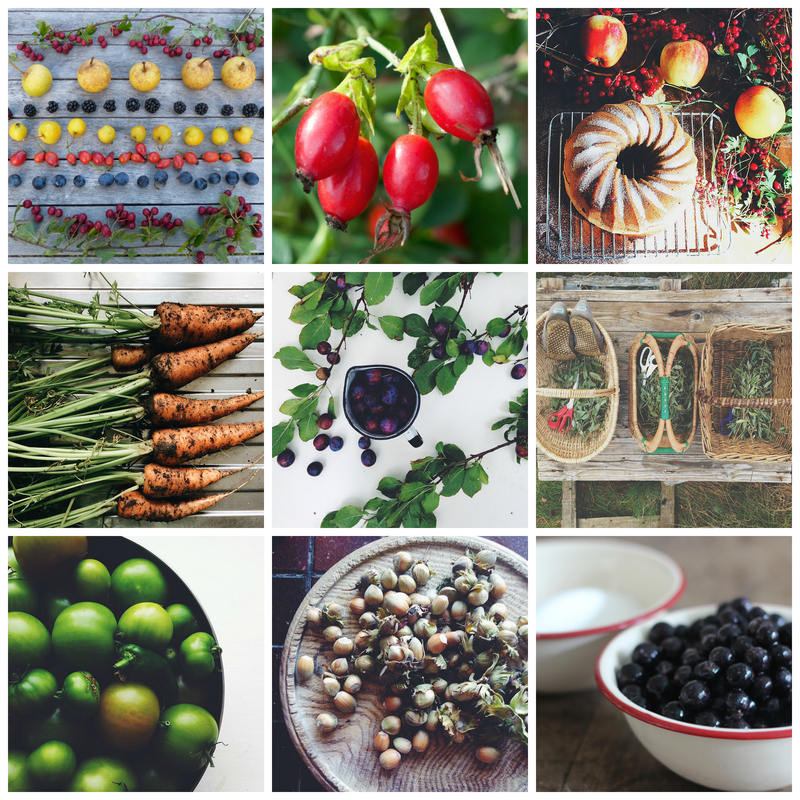 At the end of each month, we’ll share a round up on our blogs of some of our favourites and pin them to our Pinterest board: Grow, forage, cook. And a huge thank you to everyone who has joined in so far! 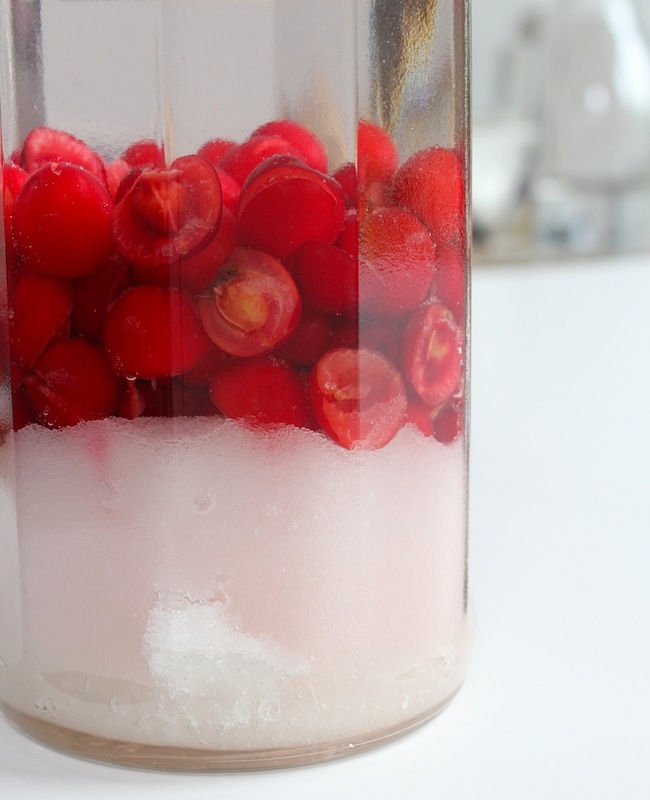 This makes 5 – 6 jars. You can scale up or down all the ingredients depending on how many plums you have. 1. First of all, get your jars on to sterilise. You can either put them through a normal wash on the dishwasher, or wash them in soapy water and then put into an oven on a low heat. If you do the latter, put them onto a baking tray and then you can pull the whole thing out at once, rather than handling lots of hot glass jars. 3. 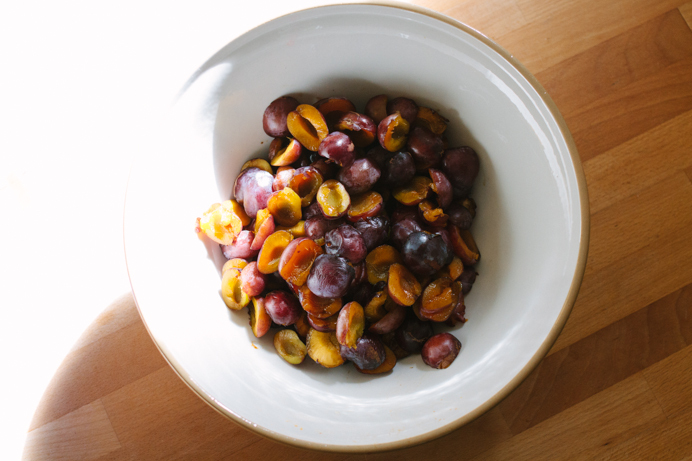 Match the rest of your ingredients to the amount of plums you have, by scaling up or down the ratios. 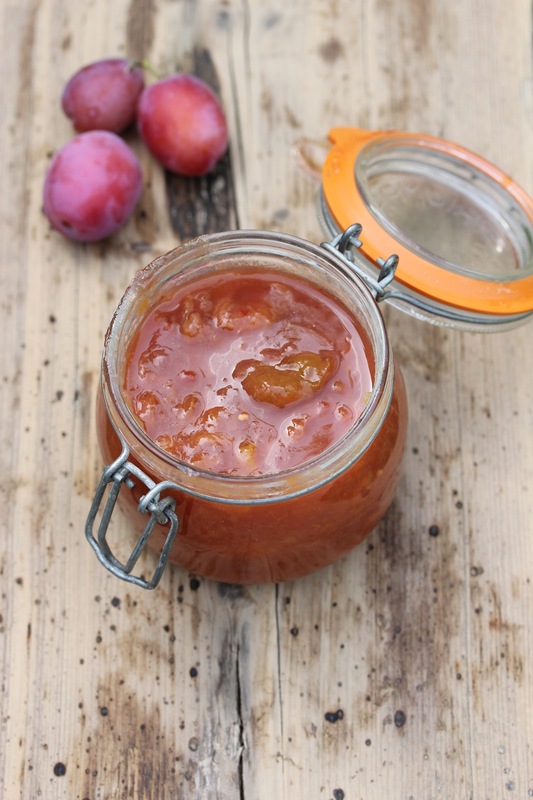 For every kg of plums you want approximately a matching weight in apples, 350ml of vinegar and 400g of sugar. Specific quantities aren’t crucial, so don’t worry too much about matching this exactly. The apples on my trees are only just starting to ripen, so I couldn’t quite match the weight of the plums, but just added what I could… It didn’t matter in the slightest. 4. 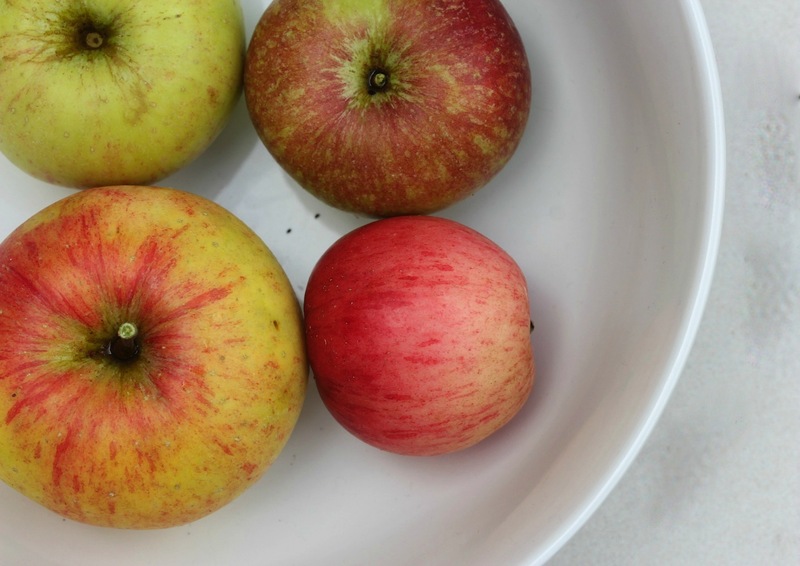 Core and chop the apples – controversially, I don’t worry about peeling them, since I think the skin softens enough not to be noticeable and I am a rather lazy cook – but if you’d rather peel them, go right ahead. 5. Stick everything into a big saucepan and bring to the boil. 6. Simmer, stirring every now and again for around 90 minutes, or until the mixture has reduced and become a thick gloopy consistency. 7. Spoon into the jars while still hot and twist the lids onto the top. The lids should depress at the top and you know a seal has been made. Delicious with meats or with cheese and biscuits. So tell me, what have you been growing / foraging / cooking recently? It’s the bucolic dream: cooking with produce fresh from your veg patch, or plucked from the hedgerow with your own fair hands. 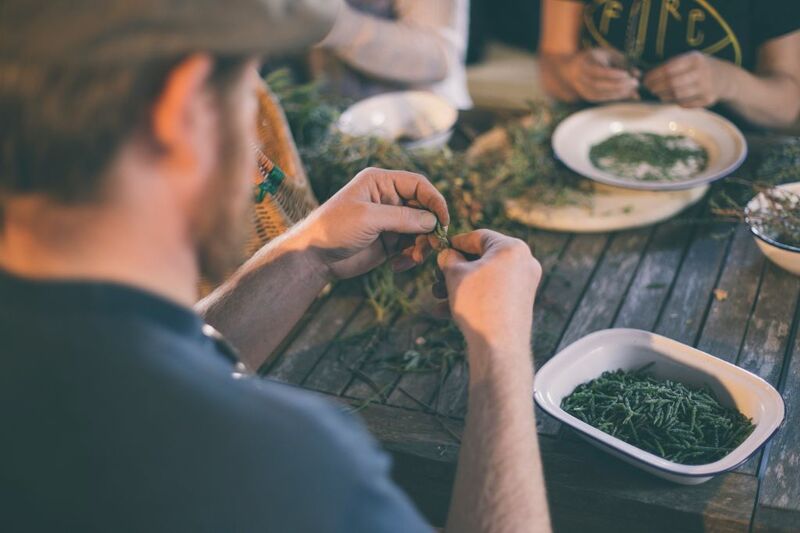 …okay, it’s possible I’m getting just a little carried away, but this new series, Grow, forage, cook, aims to celebrate the very best of at least the first part of that lovely scene: cooking with fresh seasonal produce. 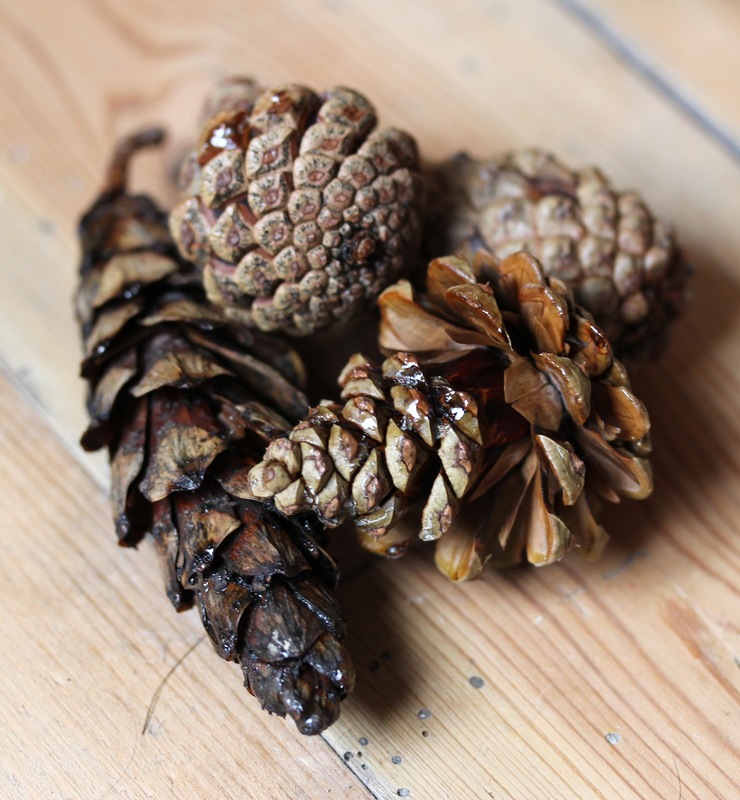 Together with my friend Laura (of the frequently bucolic Circle of Pine Trees) we plan to bring you our favourite recipes, foraging ideas and gardening tips for growing and eating seasonal produce. Laura, meanwhile, (as well as being the best photographer I’ve ever met in my life) is the world’s finest baker, so expect a range of cakes so delicious-looking you’ll be drooling over your computer keyboard. She is also a mighty fine forager, who can spot a sloe in the hedgerow at a hundred paces, and who loves to use foraged finds in her cooking. We’d also love you to join in as well. 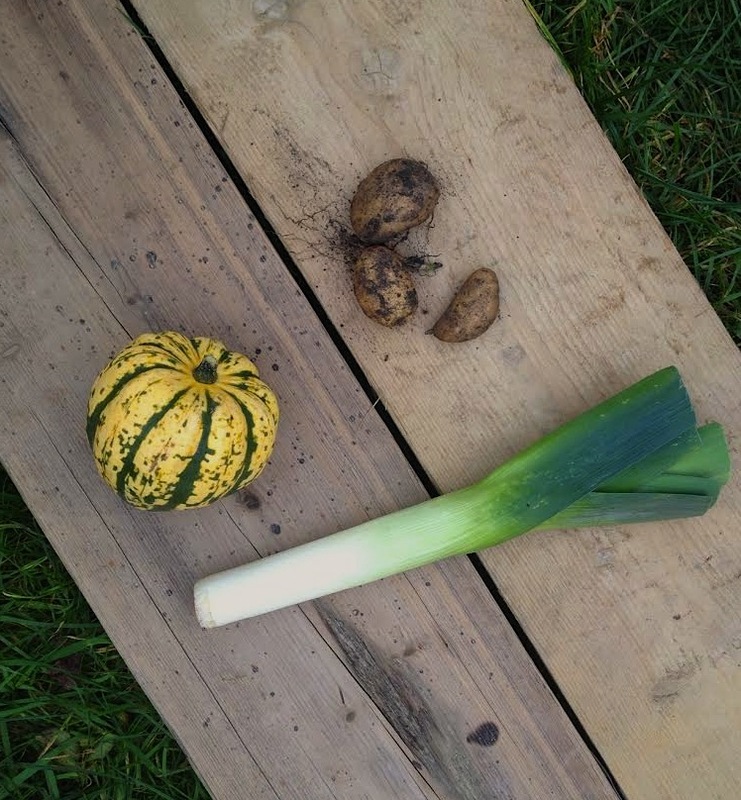 If you’re growing, foraging or cooking with seasonal produce, please do take a photo and tag it with #growforagecook on instagram; or tweet us with the same hashtag, or go the whole hog and join in with your own blog posts! If you’re in the enviable position of having a selection as to where you grow your veg, fruit and herbs, I’m pretty jealous! In my garden, there is one suitable space only, a bed at the back, on the south side, which used to be full of rhododendrons, but is now empty. My kitchen garden will go there. End of story. Don’t get me wrong, it’s not that I’m not interested in doing just that. It’s that I was already doing just that. Really, I thought, what more could I need to know? Far be it from me to deny the joys of veg gardening (of which there are many, even in years of disappointing harvest) but I have to confess that one of my absolute favourite benefits of growing your own is the chance to get something for nothing. As August has bid us farewell and summer has melted into the season of mellow fruitfulness, I’ve started to feel a little bit of a fraud. 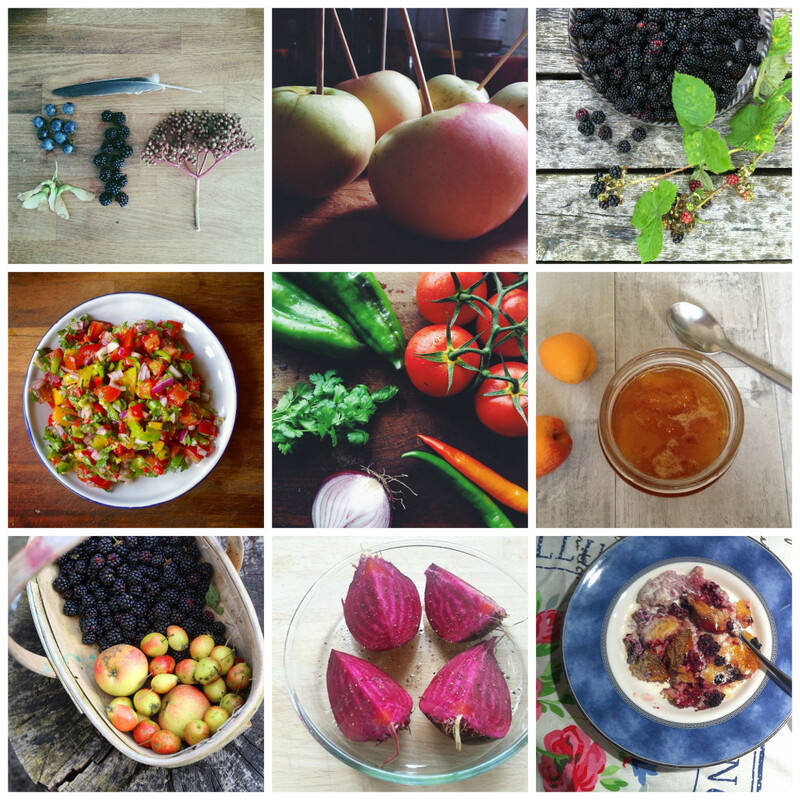 It’s been great to see so many of you joining in with our Grow, forage, cook series; Laura posted what we hope will be the first of many round ups of some of your mouth-watering photos and recipes last week: August round up. October, for me, is resplendent with hedgerow pickings- hips and sloes, and with the bounty of the fruit trees, apple in particular. Thanks to a generous friend with an apple tree, and a ever-replenishing basket of free windfalls up the road from our house, there have been windfall apples in my kitchen every day this month. Whilst they sometimes get stewed, or added to a crumble, most of them end up in Windfall Apple Cakes, the cake tin being refilled with a fresh one each weekend. 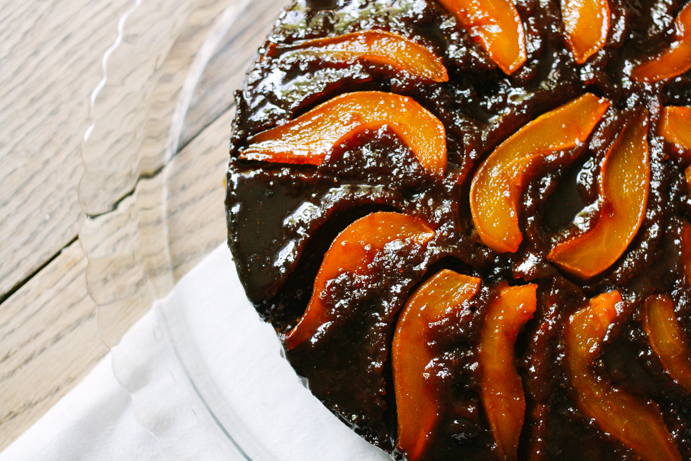 I’ve written a little about this cake, and shared the recipe, over at Leonie Wise’s gorgeous site Weekends Collected…. Since starting the #growforagecook project with Sabrina, it’s been so exciting to to connect with others who share our enthusiasm for growing, foraging and cooking! Over on Instagram, I got chatting to Rachel, who works by the coast in Dorset for Fore/Adventure. 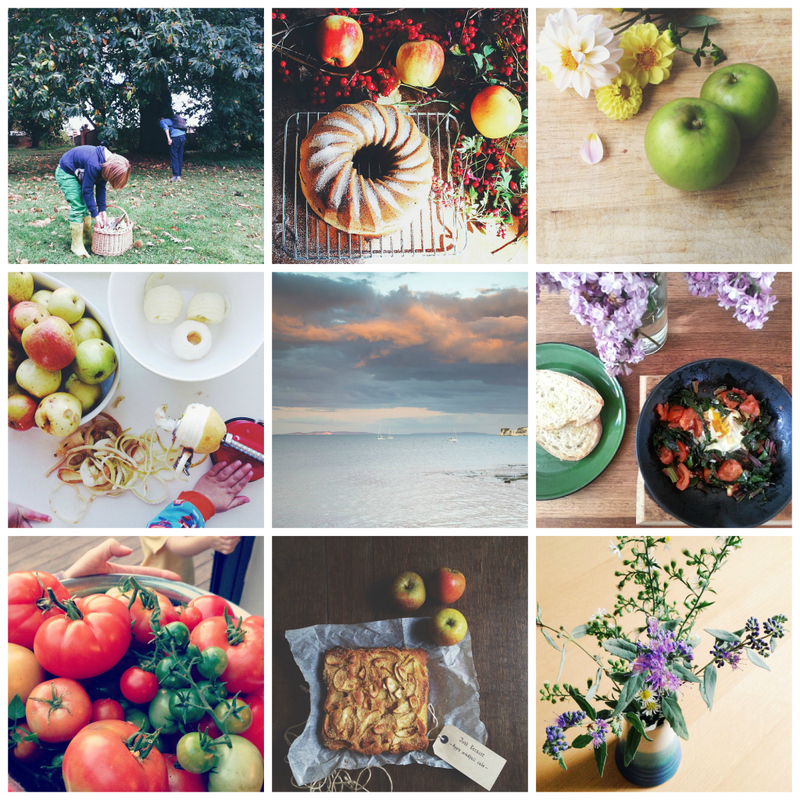 She posts the most fabulous images of foraged goodness. I discovered that Fore/Adventure provide all sorts of adventuring opportunities, from kayaking to coasteering, bushcraft to beach school, all of which look amazing. I was particularly interested, however, to learn more about their thoughts on and experiences of wild food and foraging. 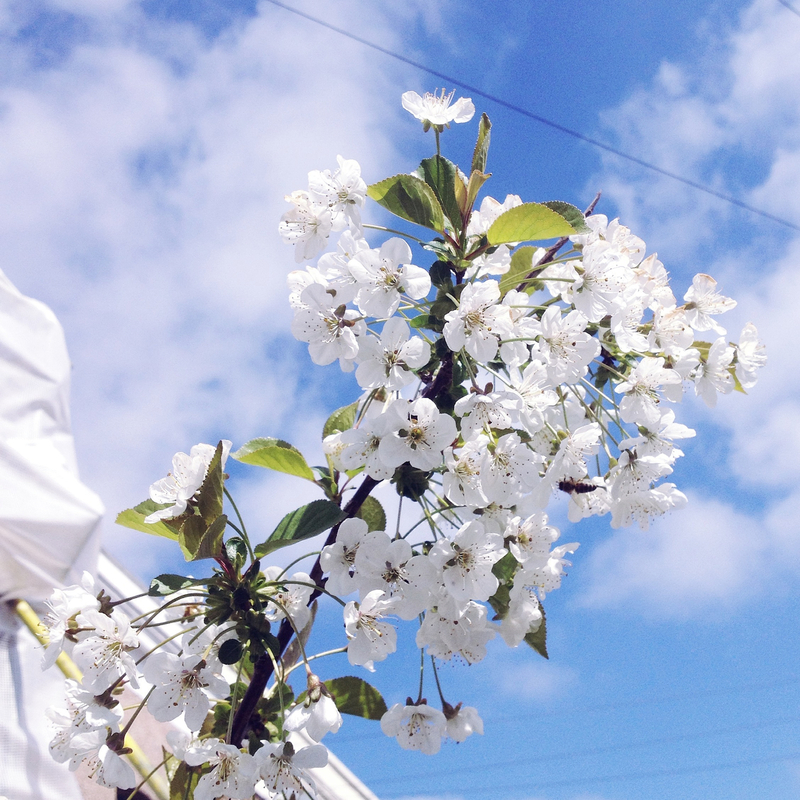 On Saturday, we took a trip to the farmers market in the sweet September sunshine. The stalls were laden down with glorious late summer bounty: crisp local apples, plump purple plums, ears of golden corn and bunches of cosmos and dahlias. I couldn’t resist a paper bag full of homegrown damsons: small and firm with an ebony gloss. I toyed with the idea of jamming them, but I have some already stashed away in my freezer, from my mother-in-law’s tree. 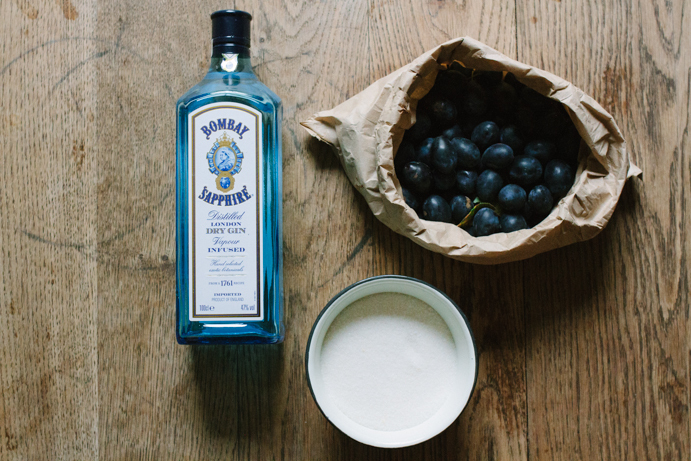 This fresh bag called out to the bottle of gin in my cupboard- time to make a fruit liqueur for sipping when the cold winter evenings make their inevitable appearance….